This is an In Person Signed Black and White 10" x 8" reproduction Photo of the popular Singer. 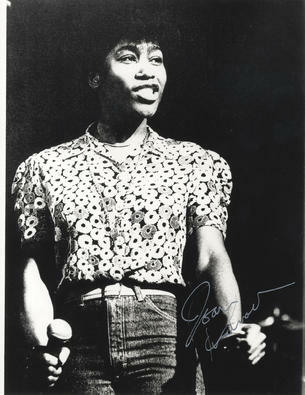 Joan Anita Barbara Armatrading, MBE (born 9 December 1950) is a British singer, songwriter and guitarist. Armatrading is a three-time Grammy Award-nominee and has been nominated twice for BRIT Awards as Best Female Artist. She also received an Ivor Novello Award for Outstanding Contemporary Song Collection in 1996. In a recording career spanning 40 years she has released a total of 17 studio albums, as well as several live albums and compilations.